WASHINGTON (Jan. 29) — Aquila Griffin, formerly of Dyett High School in Chicago, presented testimony last week at the US Department of Education, along with civil rights and education advocates from about 18 cities, testimony that said her judgment of the department will be based on how it plans to right the wrongs it has let happen in neighborhood schools. Aquila Griffin from Chicago, right, testifies using slides. At left is Gavin Alston, 12. Ms Griffin is now a junior at Dunbar Vocational Career Academy. She decided to leave Dyett because the school doesn’t have a library or offer the college-preparatory classes she wants to take. The Chicago school district is in the process of closing Dyett, where, rounded to the nearest one-tenth of 1 percent, the percentage of students who are African-American is 100.0. The percentage of students who qualify for free or reduced-price meals is about 90. She put up slides that compared the course offerings at Dyett; at Northside College Preparatory High School, a selective-enrollment school; and at Lake View High School, another neighborhood high school in Chicago located a few blocks from Mayor Rahm Emanuel’s house. Her presentation showed that students at Northside were offered 22 Advanced Placement classes, those at Lake View 12, and those at Dyett — drum roll, please — zero! 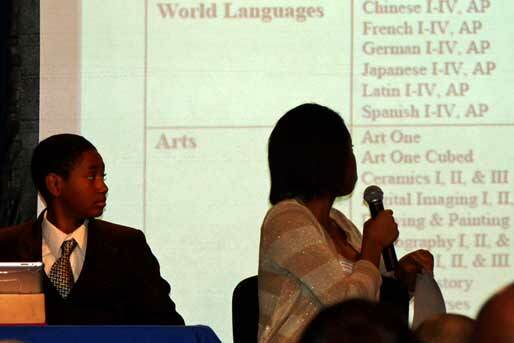 Lake View High School has “career academies,” she said, “while Dyett has nothing. They have dark-room photography and jazz, while Dyett students have to take art online.” That’s because Dyett doesn’t have an art teacher, despite the fact that an art class is required for graduation. An art class online is difficult enough, but in neighborhoods where everybody doesn’t have a high-speed Internet connection and an iPad for every kid, it can present a whole new range of problems. When I wrote a few days ago that most of the testimony at the US Department of Education by these community and education activists sounded more like a sin than a crime, I would have to exclude Chicago from that generalization. You see, a crime involving federal funds granted through the US Department of Education would have to affect educational objectives. We heard heartbreaking stories about closing schools in communities where those schools were the pillars of stability. We heard stories about kids having to travel further to school, across gang turf lines, because there were no schools in their ZIP Code. We heard how policies used by the US Department of Education and local school boards were making it more difficult for poor black students to get a quality education. But here’s the thing: Nothing that happens in Washington, in community centers, in board rooms, or even in principals’ offices matters as much as what happens in an actual classroom, where real kids get their education. The group from Chicago testified as to the impact the alleged discrimination is having on the actual classrooms in the city’s schools. This puts the Chicago story in a class of its own. Maybe a student at Dyett doesn’t want to study Mandarin Chinese or take three courses in ceramics or get college credit for taking classes in high school. But because those courses aren’t offered, it isn’t the student’s choice anymore. Chicago Public Schools has made the decision that students at Dyett will not be able to learn Mandarin Chinese or get college credit for taking courses while they’re in high school. And when the courses they want to take aren’t offered, they like going to school less and less over the years. When they like going to school less, they come to school less often, resulting in less instruction time. If they receive less instruction, their performance on the standardized tests that put the school in a failing situation in the first place gets even worse, triggering more intervention under the guidelines of the No Child Left Behind law. Districts have several options for intervention, the last resort being to close the school. But before that happens, they focus their efforts on subjects assessed on statewide tests used for accountability purposes. Those are usually math and reading in the elementary and middle grades, and include the ACT subjects of science and social studies in high school. Other classes, including most of the fun ones, have to be sacrificed in the interest of beefing up the instruction time spent on tested subjects, so the course offerings at the school get narrower. The fact that these classes aren’t as much fun as playing jazz or making a ceramic statue pushes the cycle forward. Every step of this cycle is wrong, and every step of it hurts schools in poor neighborhoods of color. This particular cycle, once in motion, can be unstoppable and irreversible. Sooner or later, the district will be able to claim it has no choice but to close the school. But that’s just the last step of the process. 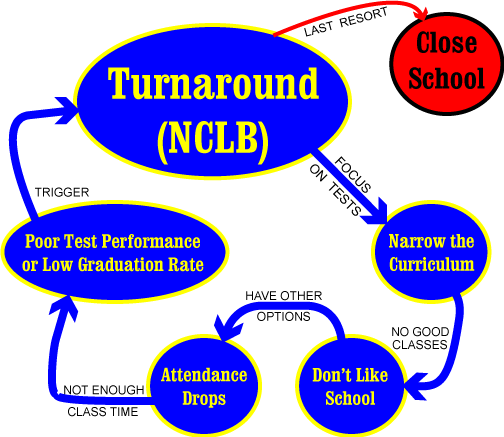 Any civil rights abuse, where there is unequal access to educational services for people based, effectively, on the color of their skin, happened closer to the beginning of the process, when NCLB’s intervention strategies created a narrower curriculum at the school. Other aspects of life at the school also decline in quality. Compare the football teams last season at Dyett and at Lake View. When the school district makes it known that it doesn’t expect students at Dyett to succeed, that discrimination pervades their lives. There lies any violation of civil rights, any school agency action that has the effect of discriminating against—and making access to quality educational services unequal for—lower-income communities of color. NCLB, while neutral, has been applied in ways that result in discrimination against groups that the Civil Rights Act of 1964 protects. A loosely aligned coalition of several communities, known as Journey for Justice, which Mr Brown from Chicago organized, is gaining momentum. They’re asking schools to stop closures until educators and communities can sort out these disparate impacts between schools in the same districts that presumably draw funding from the same pots.